During the months which immediately preceded the opening of the World War in 1914, The Chicago Tribune laid a foundation for new records in circulation and advertising. The first step was to capitalize the soaring motion picture craze for Tribune benefit. This. was done in three ways. First, The Tribune originated the idea of printing a daily directory of motion picture theaters and their attractions. Advertising men said it couldn’t be done, that a neighborhood theater could not afford to pay Tribune rates to print its program when only a few thousand out of The Tribune‘s hundreds of thousands of readers are prospective patrons. It was stiff pioneering work for the advertising department, but the Motion Picture Directory is now a solidly established feature of The Tribune. It is a service highly valued by readers. It is profitable to advertisers. It brings in more revenue to The Tribune than all other forms of amusement advertising combined. The marvelous development of the motion picture industry is in tum greatly indebted to the large advertising which it used while the older forms of amusement stood conservatively inert. Second, The Tribune originated the idea of printing a serial story in conjunction with its picturization in the movies. The Adventures of Kathlyn was the first serial· thus filmed. It was advertised extensively and sent the circulation of The Sunday Tribune swiftly upward. Third, when the World War dwarfed everything else on earth The Tribune not only covered it with staff correspondents, but sent its own motion picture photographer to the front in Belgium, in Germany, in Poland and in Russia. These War Movies of The Chicago Tribune were shown to vast audiences in all the large cities of the United States as well as in Chicago. The Selig Polyscope Company will shortly announce to the public the details of one of the most tremendous undertakings ever assumed by a film manufacturer, and one which seems certain to be called to the attention of every man, woman and child in the United States ere many weeks have passed. In the very near future the Selig people will announce the title of the first picture in a series of thirteen two-reel1 subjects, to be released every other Monday during the following six months. All these two-reel pictures are to be spectacular wild animal dramas, and each subject is to be complete in itself, though it will end in such a manner that the person who has seen one of the series will instantly realize that there is more to come, and be on the lookout for the next picture of the series. The name chosen for the series is “The Adventures of Kathlyn,” and in each subject Miss Kathlyn Williams, star of the Selig Company for several seasons past, will be featured. Miss Williams in the first picture appears as the heir to a throne in a mythical principality in India, and the following films will show the difficulties she experiences in maintaining her rule, the encounters with wild beasts of the jungle which result from her trips through her kingdom, and many surprising and strange circumstances and events incident to her retaining the crown. The stories for the entire series are being written by some celebrated author like Rex Beach, Jack London, George Ade or Charles E. Van Loan. The scenarios for the entire series come from the pen of Gilson Willetts, author of several popular novels and newspaper writer of renown, and are said to be thrilling in the extreme, and to have been prepared with the special aim in view of enabling Miss Williams to display all the many sides of her art. An arrangement has also been made by which the entire series of stories will run serially in the Chicago Tribune and the entire chain of newspapers with which the Tribune is affiliated through its syndicated news service. In other words, on the Sunday following the Monday on which the first “Adventure of Kathlyn” is released, in film form, the Tribune and some metropolitan newspaper in every large city in the United States, will publish the story of the film in fiction form in their magazine sections. The week after that the first part of the second “Adventure” will appear in fiction form, just six days after it has been released in pictures. It has been estimated that, as a result of the syndication of the stories, more than forty million people will be reached, and since each story will bear an announcement to the effect that the film on which the story is based is then being shown in the picture theaters of the vicinity, it is expected that the great majority of the readers of the story will seek the theater, where they can see the picture acted in pantomime. The film will also bear an announcement of the fact that the fiction version of the pictured story can be found in the Sunday paper (the name of which will be given) so the circulation of the paper securing the serial story will also be stimulated. No expense is being spared in staging the immense productions and whole carloads of scenery and stage effects have been built in the Chicago studios of the Selig Company, and shipped to Los Angeles, where the directors have been busy for several months with the staging of the stories. Many thousands of feet of this film have already been produced in India and will be incorporated into this series of productions, thus lending a real atmosphere to the scenes. Chicago Tribune, January 14, 1914. 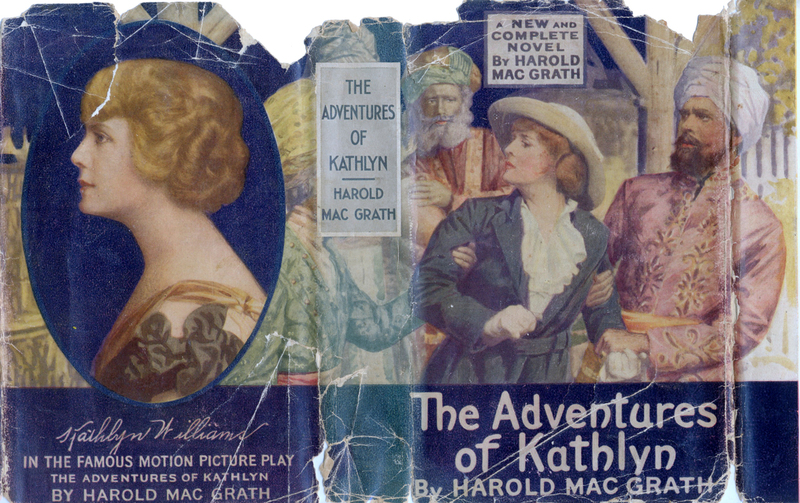 One of the concessions hung up a white sheet and showed the serial “The Adventures of Kathlyn.” At the end of the reel Kathlyn was thrown in the lion’s den. After this “trailed” a piece of film asking Does she escape the lion’s pit? See next week’s thrilling chapter! Hence, the word “trailer,” an advertisement for a coming picture. Other heroines that followed The Adventures of Kathlyn included The Perils of Pauline and Pathé’a Exploits of Elaine. The film is presumed lost: Prints exist in La Cineteca del Friuli film archive (episode 1 only); and in the EYE Film Institute Netherlands (compilation of print fragments), which can be viewed below. The Adventures of Kathlyn is a story by Harold MacGrath about Kathlyn Hale (Kathlyn Williams). She is the daughter of Col. Hare, an animal trapper sent on a secret mission by the king of a mythical India. Kathlyn is summoned by her dad to join him. Upon arrival she is told by an influential Hindu, Umballah (Charles Clary), that her dad and the king are dead. Against her will she is crowned queen and ordered to marry Umballah. This exciting story takes Kathlyn around India fighting natives and every kind of wild animal known to India. THE TWO ORDEALS (Selig), January 12.—This is the second of the “Adventures of Kathlyn” series; a very remarkable picture that is attracting attention. It has been noticed at length in The Moving Picture World’ for January 17, 1914, page 266 (above). We still think that it is a mistake to offer motion picture stories serially. The better the story, the more the dissatisfaction. N. W. Aronson, owner of the Argmore Theater, 1040 Argyle St., this city, made a pleasant call at our office last week and renewed his subscription. The Argmore is a thoroughly up-to-date, modern theater, with a seating capacity of 664. A modern ventilating plant is installed, which meets all the requirements of the proposed city ordinance on ventilation. The Argmore, with its solid marble entrance, has all the appearance of a modern $2.00 playhouse. Licensed and Famous Players service is used. 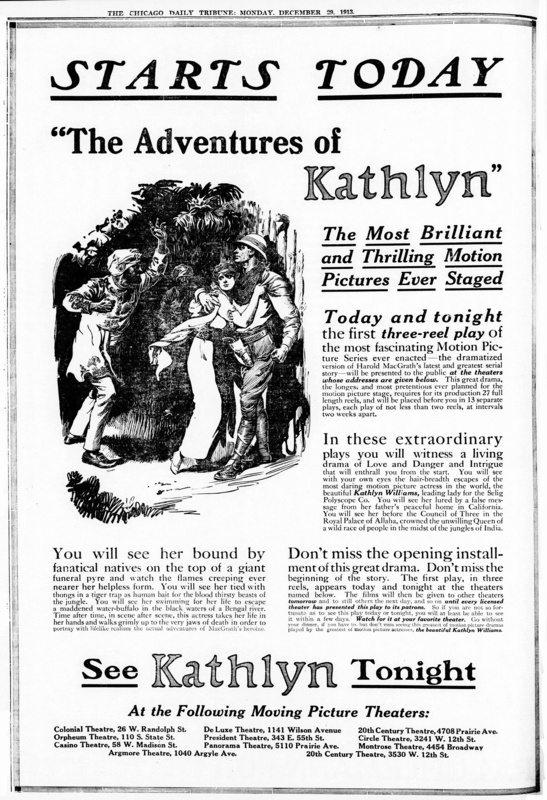 On Thursday evening, January 8, the first set of “The Adventures of Kathlyn” was shown the second time to over-flowing houses throughout the entire evening. Mr. Aronson found it necessary to call the police to regulate the crowds that clamored for admission. Fifty-one automobiles were counted, lined up on both sides of the street outside. On special feature nights the admission. of the Argmore is 10 and 20 cents. Remarkable Vogue of “Kathlyn” Pictures. With the presentation (of the second set of “The Adventures of Kathlyn” in this city, Monday, Jan. 13. managers found they could not accommodate the crowds with their usual number of performances. Extra shows were necessary in almost all the theaters where the pictures were shown. Special morning performances are being given at many picture houses. The crowds, waiting to get in many theaters, stand in line for hours. Policemen have been called to keep the crowds in line, and Chief of Police Gleason has assigned extra men to the theaters in the crowded districts. The managers also are having difficulty. Windows and sign cases have been broken in many places where the guards are unable to check the rush. It has become necessary to install extra railings to hold the crowds in line. Even in bad weather “Kathlyn” fans have been known to stand in line for nearl}’ an hour in order to get into a theater. Hundreds of inquiries are answered at the Tribune office «very day regarding places where “Kathlyn” will be exhibited on certain days, and thousands who missed the first installments are anxious to learn where they may see the first part of the interesting subject. “The Adventures of Kathlyn” is conceded by keen-visioned business men of the picture business to have been the best innovation of its kind ever advanced to increase the interest, enlarge the sales and stimulate universal curiosity and cash reciprocation of anything ever advanced in the moving picture business. For several years past, editors and picture men publicists have given their most serious thought to plans that should enlarge the selling scope of the picture product, and it remained for W. N. Selig to show the way by making a friendly alliance with the big powers of publicity, the American daily newspapers, to take an intimate, personal interest in the moving picture, calling attention to it with all the enthusiasm of something new and strange instead of following the merely conventional lines. This publicity has cleverly not only been localized, but nationalized, and at the same time taken on a news value and has been intensified through the medium of description and imagination; so that it has both reality and romance to forward and intensify interest. 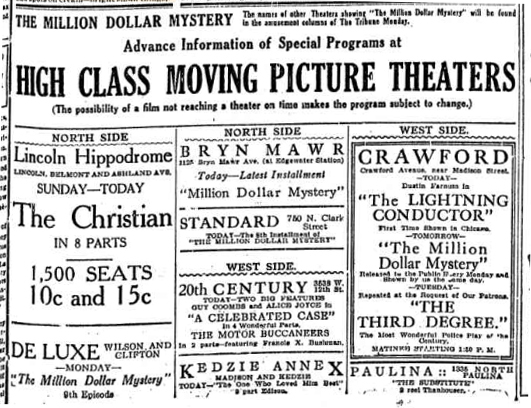 The most extensive prolonged publicity campaign in the history of the theatre and journalism combined was that inaugurated in 1914 in Chicago, whereby the Selig Polyscope Company, of which W. N. Selig is the head, and a group of big city Sunday newspapers, extending from coast to coast, collaborated for the purpose of presenting on the screen and in the countless newspapers a serial fiction story written by Harold MacGrath from a scenario by Gilson Willets and visualized in the Seligb Studio in Los Angeles—”The Adventures of Kathlyn”—the longest photoplay that had been released up to the time of this writing. Two reels constituted each of the twice-a-month releases, save the first of the thirteenth, which required three reels, the complete production being in twenty-seven reels. The tremendous publicity through the weekly installments in so many important newspapers marked a new era in the film industry. 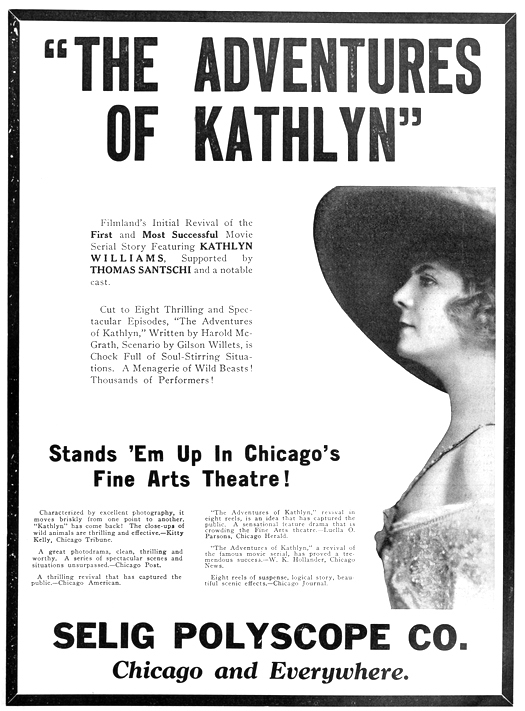 One of the Chicago newspapers not included in the number presenting the serial for several consecutive days published interviews with different players, directors, and mechanics concerned in the production, and through this source it was learned that a prominent Chicago exhibitor who had long been accustomed to combining vaudeville and motion pictures eliminated the latter just before the advent of the “Kathlyn” series, giving as his reason that motion pictures having reached their zenith, were now on the decline, that he shifted to vaudeville entirely through fear of losing his public following. 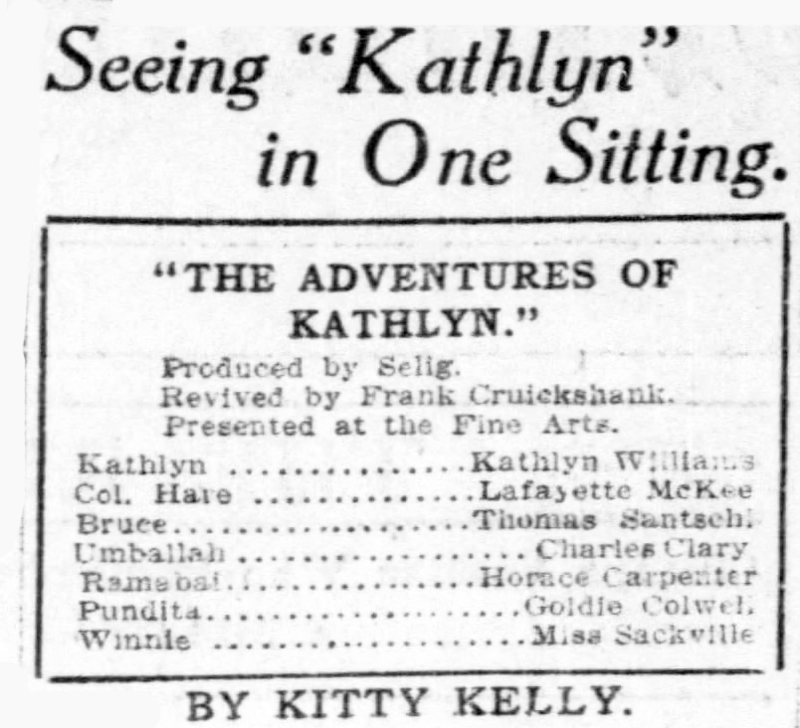 When the “Kathlyn” series was started, this exhibitor, attracted by the newspaper accounts as well as the illustrated full-page chapter in the “Chicago Tribune,” proceeded at once to a near-by theatre owned by his rival, and was so impressed by the production and by the crowds seeking admission that the next day he announced “The Adventures of Kathlyn” as a regular three-day attraction in one of his theatres, and in the others each installment was kept for an entire week. Now eleven new theatres in Chicago present the film serial every day. The spectacle of a line a full block long approaching the box office was almost daily on view in different parts of the western metropolis. Mr. Selig truly has shown great enterprise and not a little of that rare quality called showmanship throughout his long and unexampled film career. One of the earliest pioneers in the industry, his efforts have long since ceased to be characterized by selfish aims. Undoubtedly Mr. Selig attributes much of the financial success of the Kathlyn series to the advertising resulting from the combined co-operation of scores of vastly circulated newspapers. In fact, the number of publications which presented the fiction series was greatly augmented after the first few chapters were released, for at the time of this writing many of the moderate sized cities have been added, and Mr. Selig has been so impressed with the outcome of his first effort along these lines that he has formulated elaborate plans for the future through which photoplays involving months of preparation and unprecedented expenditure for production will be released simultaneously in installments with the fictionized chapters in the principal newspapers of every large city in the world, irrespective of language. 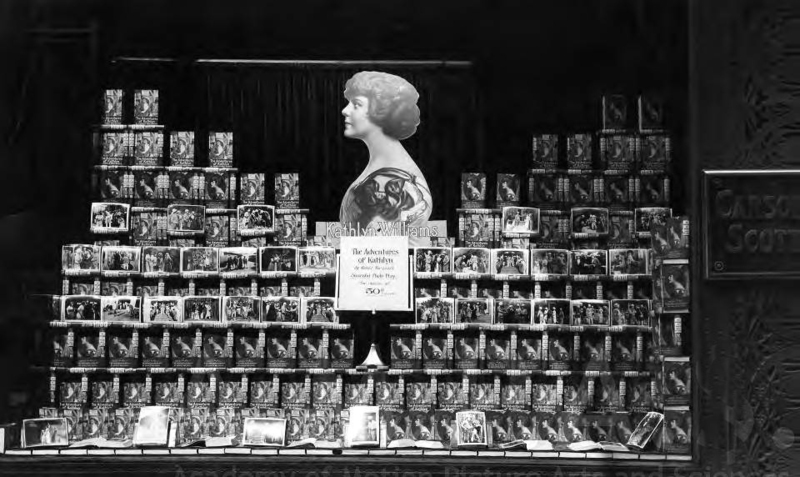 Selig introduced synergy with “The Adventures of Kathlyn” as well, publishing Harold MacGrath’s novelization of the series, leading many bookstores to organize window displays, such as the one at Carson, Pirie Scott & Co.’s store, of the book, film stills and Williams’ standee in shop windows. The “Photoplay” edition of the book contained movie stills to add punch to the text. Persons subscribing to “Photoplay Magazine” in 1914 could obtain a free cloth-bound edition of the book. Remarkable Publicity Campaign for Pictures. 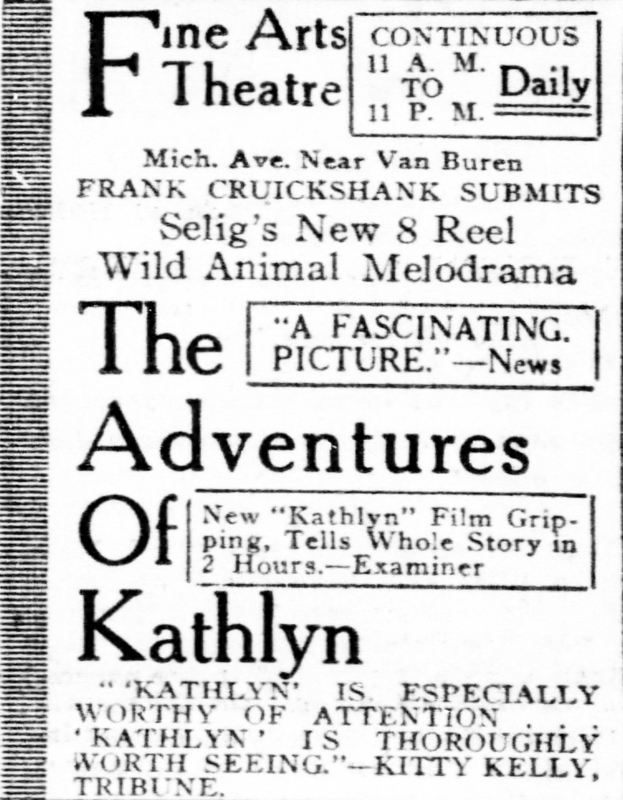 For three weeks preceding the release date (Dec. 29), of the first set of “The Adventures of Kathlyn,” readers of the Tribune, American, News and Journal, this city, were puzzled by display advertisements concerning one Kathlyn. 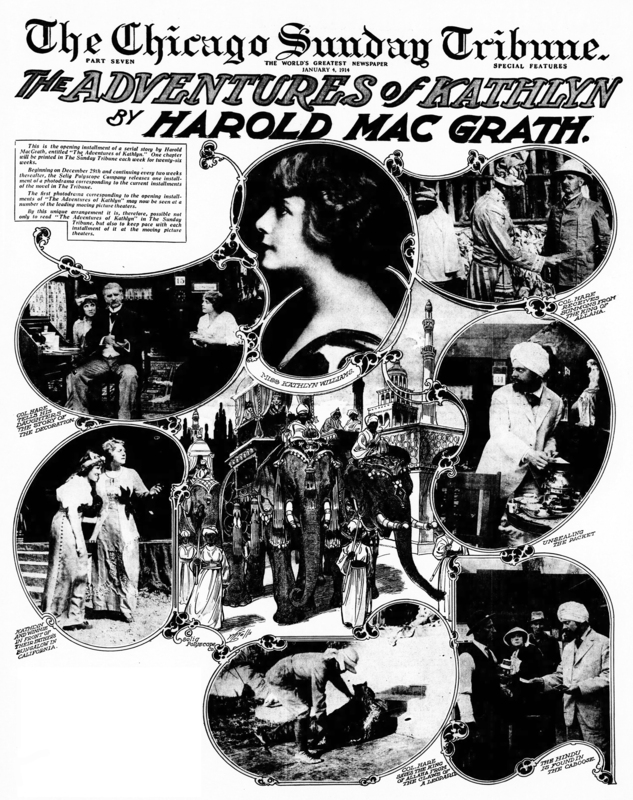 The space used at first was small, and it gradually increased until a whole page was used in the three last mentioned papers, while the Tribune had two full display pages and two pages, in connection, devoted to the first chapter of Harold Mac Grath’s serial story and beautiful illustrations in colors. These took up the entire magazine section of the Sunday Tribune, January 4, and over 500,000 extra copies of this section were printed to meet the requirements. The well laid and perfectly carried out plans resulted in a great tidal wave of interest and curiosity throughout the city. This culminated in a turnout of crowds at the eleven theaters—which were advertised to be the first in the city at which Kathlyn arrived—such as had never before been seen here. The box office records were broken at most of them. For each of the next twenty-five weeks the Sunday Tribune will run a chapter of the story with colored illustrations, and also attractive display advertisements on certain week days. The other three Chicago papers mentioned will also run displays on week days during that period. William L. Selig, president of the Selig Polyscope Co., is responsible for this innovation in moving picture advertising. He has fairly astonished everybody in the business by his enterprise, and has given an impetus to the trade that is hard to measure. Exhibitors can readily compute its value, for it comes direct to them; but the whole trade generally derives a benefit that is far-reaching and up-lifting. Ashville (N. C.) Citizen, Richmond (Va.) Times-Dispatch, Mobile (Ala.) Register, Memphis (Tenn.) Commercial-Appeal, Meridian (Miss.) Star, Atlanta Constitution, Sioux City (la.) Journal, Minneapolis Journal, Omaha News, Muskogee “(Okla.) Phoenix, Rocky Mountain News (.Denver), Boise (Idaho”) Capital News, Eugene (Ore.) Register, San Jose (Cal.) Times-Star, Los Angeles Times, Boston Globe, Buflfalo Times, Philadelphia Record, Pittsburgh Leader, Baltimore American, Washington Star, Youngstown (O.) Vindicator, Dayton (O.) Journal, Detroit Free Press. Houghton (Mich.’) Mining Gazette, Syracuse (N. Y.) Herald, St. Louis Times, San Antonio Light, Fort Worth Star-Telegram, Houston Post, El Paso Times, Phoenix (Ariz.) Republican, Montreal Star, Moose Jaw News (Saskatchewan), Calgary (Alberta) Herald, Winnipeg Telegram, Louisville Courier-Journal, Schenectady (N. Y.) Gazette, Grand Junction News (Colo.), North Yakima (W’ash.) Herald, Toronto Star Weekly, New York Sunday Sun, New Orleans Item, Birmingham (Ala.) Age-Herald,’ Abilene (Texas) Reporter, San Diego (Cal.) Union, Chicago News, (Chicago American and Chicago Journal. Now that the remarkable series of motion pictures and newspaper installments of “The Adventures of Kathlyn” are under way, something is learned of the almost unlimited facilities necessary to produce such a pretentious picture. 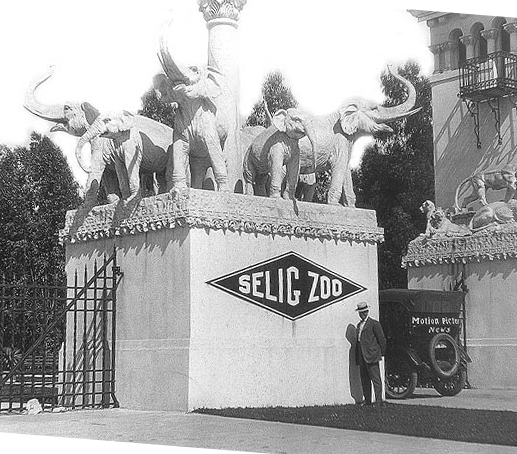 Only an establishment having the facilities such as are possessed by The Selig Polyscope Company, would attempt a production of such magnitude, exacting in its demands upon the players and involving the service of forty African lions, a herd of elephants, leopards, tigers and many other beasts of the desert and the jungle. Many of the scenes showing the wonderful architecture and invested with the atmosphere of the Orient, were taken in India, indicating how carefully studied this production was in its conception and execution. It is claimed that this play for the first time shows many interesting sacred rites performed in the lands of the Parsee. The close-up scenes of the Burning Ghats of Benares and similar rare ones can be cited in substantiation of these facts. The scenes of the Durbar enlisting a herd of elephants and camels, elaborately panoplied with read Indian hahouts and camel drivers, as well as a large company of actors led by Huri Chand, who is said to be the foremost thespian of India, give realism. It is said that the costumes for these particular scenes cost $25,000. Fortunately the Selig zoo at Eastlake Park, in Los Angeles, which has the largest collection of wild animals owned by any individual, barring the Hagenback collection at Stellingen, near Hamburg. Germany, comprises the largest collection of carnivora, forty-five lions, six leopards, six tigers, ten elephants, a pair of giraffes, a drove of camel and many other specimens too numerous to mention—furnish the habitants of jungle land in variety in their natural surroundings. The Selig zoo, a tract of forty acres, is in reality a great botanical garden with the flora and fauna of tropical lands. It hardly need be remarked that Kathlyn Williams, the intrepid and beautiful leading lady of the Selig Stock Company in Los Angeles is the heroine of this series of plays. Newspapers which arc running serial installments of “The Adventures of Kathlyn,” in harmony with the picture releases are: The Chicago Tribune, the New York Sun, the Boston Globe, Philadelphia Record, the Baltimore Record, the Pittsburg Leader, Detroit Free Press, Minneapolis Journal, Toronto Star, New Orleans Item, Rocky Mountain News, El Paso Times, Calgary Herald, Los Angeles Times and forty-five other dailies. FULL LENGTH FEATURE FILM RELEASE. “Kathlyn” is coming back. The great Selig serial that put serials on the film map and that kept many a person gasping through one week until the next has been condensed now into eight active, unpadded reels, presenting Kathlyn Williams, her colleagues, and her animals. It will be shown at the Fine Arts theater, with special music and near East Indian ushers and other atmospheric effects, beginning today. As it was an innovation in serials of The Tribune and the Selig company, so it may prove an innovation in revivals, and we may be treated to tabloid film forms of all the mysteries, perils, and palpitations that have followed in the trail. “KATHLYN” has come back. Kathlyn who went adventuring amongst disguises and jungles along in the years 1913 and 1914. Her serial ways have been reduced to two hours’ performance, which is supposed to chronicle the highlights of her Amazonian adventures, minus the padding that existed in the prolongation of the suspense her ways with the wilderness were supposed to excite. As such an honored sample of originals “Kathlyn” is especially worthy of attention. Considering the great leap of picture progress occurring within just the year, the photoplay accomplishments of “Kathlyn” are remarkable. It is characterized by excellent photography and it moves briskly to one point or another, though little things like logic and plausibility are lacking as ingredients. The closeups of the animals are interesting and effective, but they don’t strike specially active thrills a-travel down one’s vertebrae. Of course, fashion in thrills has changed. Since “Kathlyn’s” pristine day we have had more of them and more serious ones, till now we are accustomed to enduring tumbles from skyscrapers and seeing people jump from aeroplanes to moving trains and other little feats of that sort with scarcely the w. k. flicker of an eyelash. So when Kathlyn registers wild fear in one section and then in the next we see some lions placidly traveling across the screen, pulses don’t pulse particularly extra fast. But fashions never do stay the same. Kathlyn herself as heroine is a most put upon lady. She never has time, robed in a diaphanous negligee, to take tea on a chaise-lounge. No, she has ever to be up and hustling from one disguise into another, getting crowned, escaping, helping someone else to escape, being recaptured, busily and repeatedly before “the curse of inheriting the crown of Allaha” has been removed from her family and she has a chance for the pink tinted silhouette kiss of finale. As reminiscence of a very important step in picture procedure, “Kathlyn” is thoroughly worth seeing. Moreover, in these days of advertised “sirens” and generally flaunted film wickedness it is a rare relief for its absolute respectability. There isn’t a thing to offend the nicest minded. Frankly, there are situations to provoke a smile from present day sophisticated seers, but the seers enjoy the smiling. The houseful yesterday was alert with comment. Apparently a pleasant time was had by all. KATHLYN WILLIAMS (May 31, 1879 – September 23, 1960), famous as the heroine of “The Adventures of Kathlyn,” is the leading lady of the Selig Polyscope company. She was born in Butte, Mont., and spent her early life there. During her senior year in high school the failing of family fortunes compelled her to start out to seek her own, which she did with a modesty and force of energy that soon demonstrated her superiority in mastering whatever she undertook. Miss Williams’ charm of face and grace of figure, her poise and histrionic resourcefulness attracted the attention of a Western theatrical manager and he engaged her for small parts in a Butte playhouse. She had not been on stage long before she was observed by Senator Clark, the copper king, who made inquiries about the young girl and offered to polish the rough diamond. Through Senator Clark’s generosity Miss Williams was sent to the Franklin Sargent Dramatic School of New York, where she studied for two years with such a vidity and to such advantage that she accomplished wonders and was, at her graduation, accorded the position of leading woman with a dramatic company. William N. Selig, seeing Miss Williams on the stage, recognized her capabilities and engaged her as leading woman for his stock company in Chicago. Miss Williams immediately entered into the new work with a zest that made her a valuable acquisition for the serious side of the motion picture business. Having run the gamut of the sentimental and tragic heroines, Miss Williams became the favorite for a new sort of drama, in which wild animals figured vitally and pictorially. The beasts of the jungle prior to this time have never been brought into the lines of the camera, without steel bars between. Miss Williams is of the Anglo-Saxon strain—fair haired and blue eyed. Hers are the blue eyes that never fear or falter, and so it was conceded that she was past mistress in all plays that required unusual risk and daring. It would be a twice-told tale of her daring escapes when lost in the jungle, where the leopard leaped upon her and was driven off only by strenuous efforts of supernumeraries; of her adventures alone and unarmed with savage black-maned African lions; rides on the back of an elephant ripping through the jungle. The difficult and unexpected offer a peculiar fascination to this trig, firmly knit, resourceful, intrepid gentlewoman, who has the classic cast of heroic face, with nothing suggestive of feminine fear. She has been in all sorts of predicaments—from a flight in the hydroplane and a fall in the lake, to the collision of a train and the wrecking of a locomotive. These dangers have not been met, passed or overcome without unusual risk, but Miss Williams never shirks a duty, rather courting a dangerous situation for the sheer spice of novelty. “It is all in the day’s work,” says Miss Williams. Leo Feist, the well-known music publisher of New York, with branches all over the world, will soon issue a waltz entitled the “Kathlyn” Waltz that will be copyrighted in all countries. The waltz has been composed specially, on the order of Wm. N. Selig, by one of the most talented Feist composers. 1 Each reel ran about 10 minutes.